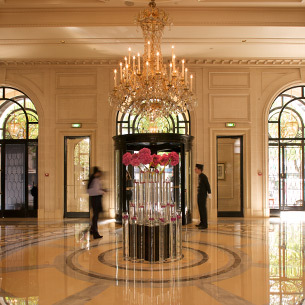 A new emblem of Parisian luxury hospitality, the name of The Peninsula Paris has inscribed itself the long list of historic palaces that have been metamorphosed by AFFINE DESIGN into contemporary luxury hotels. 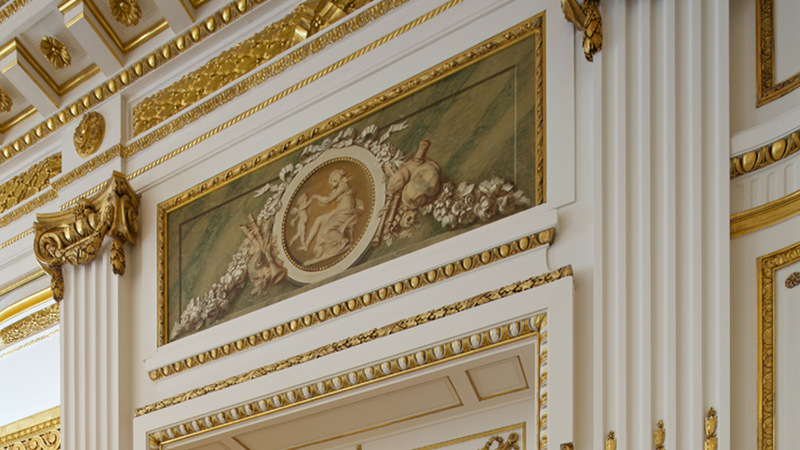 After having restored the lustre to the Four Seasons George V, celebrated luxury palace of the French capital, resuscitated the Résidence de la Trémoille and the Pershing Hall Hotel with Andrée Putman, AFFINE DESIGN has recently completed the renovation of Roland Bonaparte’s hôtel particulier, located place d’Iéna, which now hosts the Shangri-La hotel, a building listed as a historic monument since then. 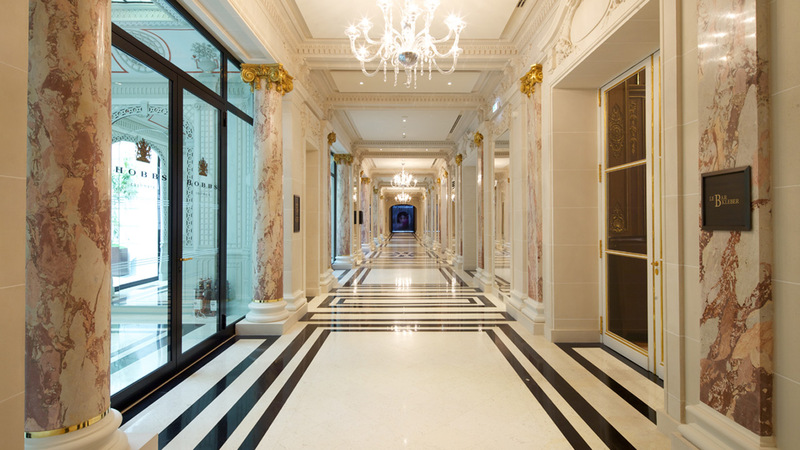 With the restoration of the Peninsula Hotel Paris, AFFINE DESIGN distinguish themselves, once again, in their ability to restore majesty to a historic luxury hotel, illustrious witness of the great Parisian epochs. 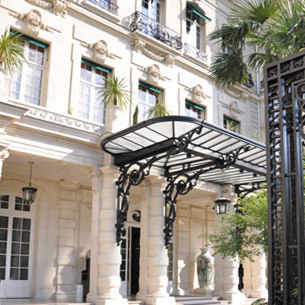 Built in 1908 to host the former Hotel Majestic, this building has long been part of the Parisian landscape due to its style – the Second Empire, when architecture was very eclectic. Its decors, today restored to their original state, suffered brutal transformations during its successive occupation by Unesco in 1946, and in 1958 by the Ministry of Foreign Affairs, when the building was used as the International Conference Centre. In 1974 the Paris agreements were signed within its walls, putting an end to the Vietnam War. 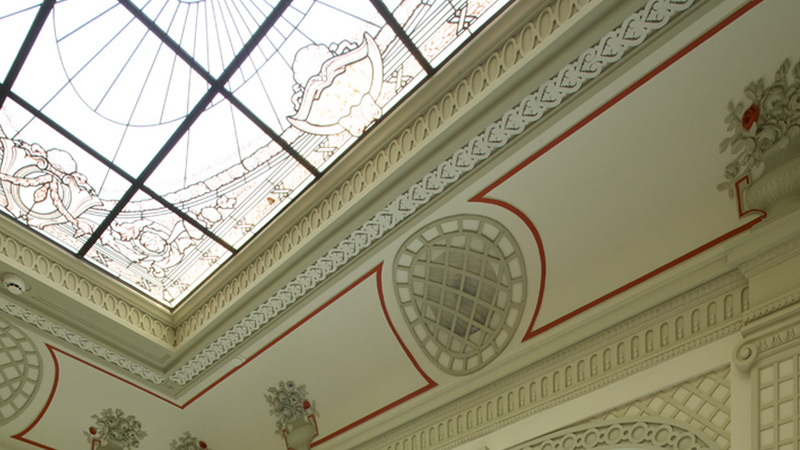 Preserve the soul of a place and revive its treasures, these are the missions of Richard Martinet, architect and civil engineer of the École Nationale des Ponts et Chaussée. Director of AFFINE DESIGN, he has led a multidisciplinary team, expert in subtle masterworks, in providing a contemporary scenic context which redefines new standards in matters of design, luxury and comfort, the distinctive signs of premium and international hospitality of the 21st century. 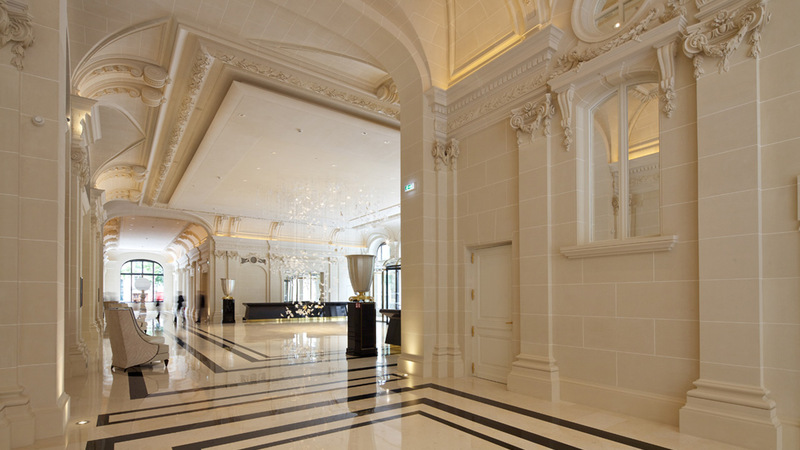 During the four years dedicated to the restoration of the Peninsula Hotel Paris, nine hundred labourers have worked on the site to give to restore majesty to the many key pieces of the building, the green Campan marble columns, mosaics of the Rotunda, the majestic foyer ceiling and the hundreds of restored pieces of original woodwork. To complete the renovation, Richard Martinet and his team have been working to again allow the light of day to penetrate throughout the building. Daylight that floods the reinvented patios on the ground floor or that caresses the immense glass roof, realised on ​​the top floor, which shelters the restaurant, l’Oiseau Blanc, offering an incomparable view of the whole of Paris . Clarity found also in the access galleries, thanks to the 700 square meters of glass and monumental gates, 17 meters high, which have been added. 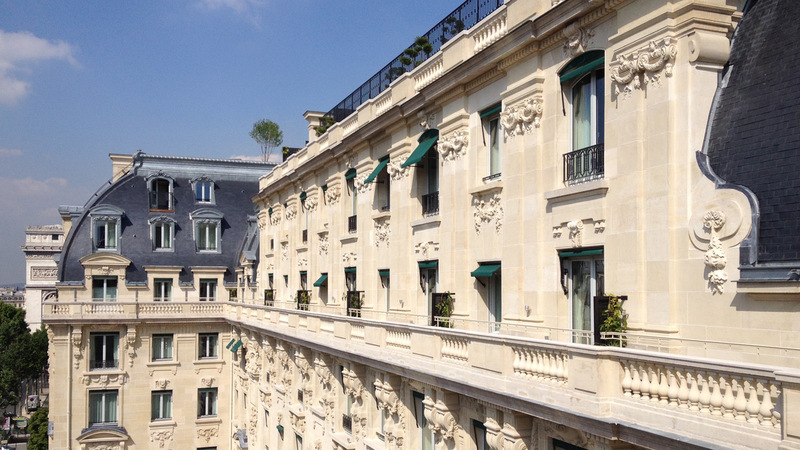 In front, the thousand square meters of carved limestone constituting the Saint-Leu-la-Forêt of the facade are the exact restitution of those of the Majestic Hotel. Finally, the finest artisans were invited to the site: finishers, canvas restorers, experts in stucco, gilders, glaziers and locksmiths; ancestral knowledge at the service of this superb restoration led by AFFINE DESIGN. For each project, the method consists of meticulously scrutinizing the building in order to find its original components and understand the transformations it has undergone. This historical work of exploration spans official documents, layouts and photos, as well as on-site physical and technical investigations, in order to reveal the treasures that remain, hidden behind false ceilings and partitions, searching for traces of hidden decors and rediscovering original pigments through chromatic analyses. These explorations are none other than a preparation phase for spaces destined to new uses. 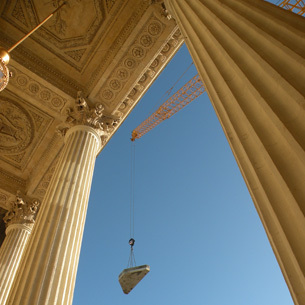 “Our aim is not to restore old stones, we are not Heritage Architects,” explains Richard Martinet, “but we work with pure heritage elements in order to do something else with them, it is totally different”. That is to say, the creation of an ambiance nurtured with intuition where the structure keeps its equilibrium in a mise-en-scène inspired by the spirit of the place. A universe whose decor will linger in the memories of visitors, like a well of emotions.